Owning a CNC router would have been unthinkable for a small woodworking shop just a few years ago. The high cost of these remarkable machines meant that CNC routers were out of reach for all but the largest operations, but recent cost reductions have meant that even do it yourselfers can have the power and versatility of a wood router. A CNC wood router can be a great investment, especially if you want to produce high quality signage. With such a machine the user can input almost any design into the software program and produce intricate engravings, three dimensional effects, and even pictures of people or animals that are incredibly life like. 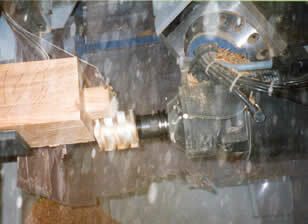 Because the routing head of a wood routers is controlled by a computer, a unit is able to produce exact replicas of the same design every time. This can be very useful if you are planning to sell custom signage, because you can produce "blank" signs for samples. You will also be able to fill large orders quickly and easily. For these applications you won't need an expensive 5 axis machine , but just a simple 3 axis router. 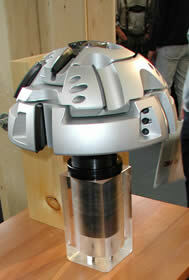 A CNC router is also useful if you are planning to build multiple pieces of the same component. Shelves, drawers, and other parts of cabinets and furniture can be produced quickly, saving you time and effort. Because the machine works much faster than a hand operated router it is essential to purchase quality CNC router bits or perhaps better be called router "heads". Good quality carbide router bits are surprisingly inexpensive, and a full set can be purchased for a very reasonable cost. With a good set of bits you can create beautiful rounded edges, tongues, or grooves. Many manufacturers also offer sets of CNC router bits which include two of every size and type of bit so that productivity will not suffer because of a broken bit. Maintenance of any CNC machine involves checking the safety features of the router. Guarding should be kept to as close as possible of the router bit. In order to use the machine, you have to program the computer to do the CNC routing job you want. This process involves entering the tool specifications, the direction and the feed speed if you don’t have a template. Those who are used to using routers have templates which allows them to get set up really quickly. Feeds and cutting speed for CNC router bit is generally a learning process for first time users. You have to experiment to see which on is right for your particular task or which one feels right to you. The desired finish, the tools and the geometry influence the feeds and cutting speed of your CNC router. Best stick with the instructions that came with your machine and from there on develop your own best settings tables for both router bit durability and excellence of routing result. SCM was one of the first companies to pioneer CNC technology, and SCM CNC routers are still rated as some of the best in the industry. One of the best ways to get into computer numerically controlled routing is by purchasing a used SCM router – though you may not get the latest model, you will be able to access SCM's well developed customer service network and benefit from new innovations and techniques created by SCM since the model was new. Purchasing an SCM CNC router is a sure way to ensure you get the highest quality in the woodworking routing field.